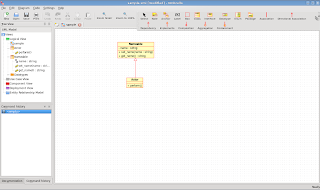 Shortly after updating my Ubuntu system to 8.10, I got an update for Umbrello, the UML diagramming tool. So far, I'm very impressed. The application is essentially the same but it actually works with KDE 4. Here is a screen shot. So, I suppose I'm not excited about Umbrello itself. Just the fact that it works with KDE 4. I never thought I'd say it but KDE 4 has impressed me thus far. Not exited about Umbrello... For what reason? I've tried Umbrello, and found it not that useful, except for doing class diagrams (and maybe generating the code, not tried it). But, the other diagrams are not that great. You can read my Umbrello review if you want.